This morning we had the difficult decision of how to finish the new kitchen floor. In the end, we decided to choose the more "environmental" option. While we both somewhat preferred the look of the oil-based finish at the back right, Jeff decided to go with the water-based clear coat. The brand is Bona DTS (Deep-Tone Sealer) and it claims to be VOC Compliant. We've been struggling a bit with our choices for floor finishes. Yes, there are low-VOC and no-VOC finishes available, but they really aren't as durable and long-lasting. 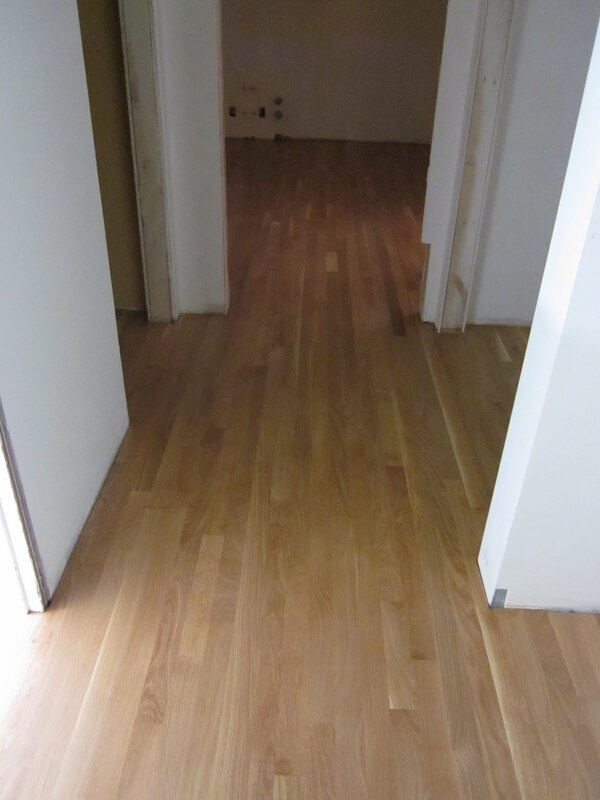 We don't want to have to keep refinishing these floors. So, for this choice, we decided to go with a product the floor refinisher said is supposed to be durable and will have a reasonable life before we need to recoat or refinish it. How the floor looks after the first coat. Since we cannot walk on the floor this evening, it's somewhat amusing the path we must take to the bathroom. We are "living" in the basement, but the bathroom is on the 2d floor. To avoid walking on the kitchen hallway floor, we must go outside through the side door and walk around to the front of the house and enter the front door, then head up the stairs to the 2d floor. Though, it's less amusing since it is raining today.